Puckpool Park Wireless Museum, Seaview, Ryde, Isle of Wight, PO34 5AR. Tel: +44 (0) 1983 567665. The museum houses a good collection of vintage wirelesses and radios. Location: In the centre of Seaview. Bembridge Windmill, High Street, Bembridge, Isle of Wight PO35 5SQ. Tel: 01983 873945. Grade I listed windmill. One of the Isle of Wight's best known landmarks. The only surviving windmill on the Island. Built c 1700 and still with its original machinery intact. National Trust. Charges apply. (Photo &COPY; NTPL / Andy Williams). www.nationaltrust.org.uk. About 4 miles south of Seaview. Seaview Wildlife Encounter, Seaview, Isle of Wight. Tel: 01983 612261. Formerly known as the Flamingo Park. Seaview Wildlife Encounter helps conserve exotic bird species and wildlife. Large free car & coach park. Full access & facilities for the disabled. Location: In the centre of Seaview. Also see Seaview Seaview travel. 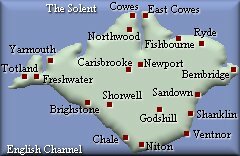 Also Ventnor hotels Isle of Wight Yarmouth hotels Isle of Wight.